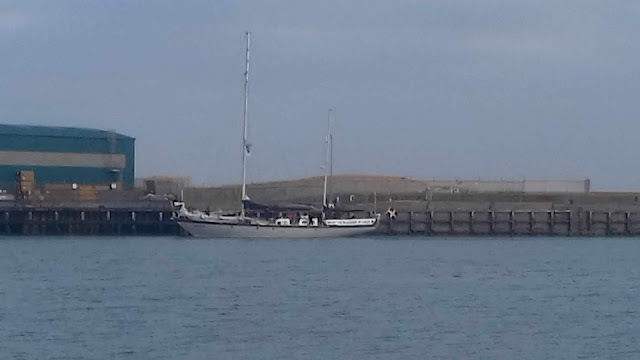 Brighton PSC was privileged when, at the beginning of June, we met and hosted the crew of one of the flotilla’s ships, Freedom, when it docked in Brighton. It was a wrench when we had to say goodbye after 3 days to these wonderful people. Freedom had sailed from the Norwegian port of Bergen and we met it at Shoreham. It was only here for 3 days but we got to appreciate the kind of people who would put their lives on hold and risk the hazards of Israel’s military in order to try and relieve the suffering of others. Although under no illusion as to what would happen when they tried to deliver medicines to Gaza, the crew of Freedom were determined to try and break Israel’s Nazi-style blockade of Gaza, a blockade which is turning Gaza into an uninhabitable stretch of land, a place where Israel lets in only enough food to keep people from actually starving and restricts even such basic things as medicine, whilst pretending that Gaza is no longer under occupation. The Freedom and before that Al-Awda were apprehended this week in international waters. Their boarding was completely illegal according to international law and was an act of piracy. But since international law has no enforcement mechanisms and the USA backs it to the hilt, Israel doesn’t pay a blind bit of attention to it. Disturbing reports soon came in of unprovoked violence against the crew of Al Awda, including the use of tasers, against people who were completely defenceless, unarmed and offering no resistance. They were humanitarian workers, aiming to relieve the distress of those in Gaza. Their only crime the delivery of medicines. Israel was under no illusion as to what kind of cargo they were carrying and made no effort to inspect the cargo. The only point in boarding the ships was to enforce the starvation siege of Gaza. The silence of our government is deafening. 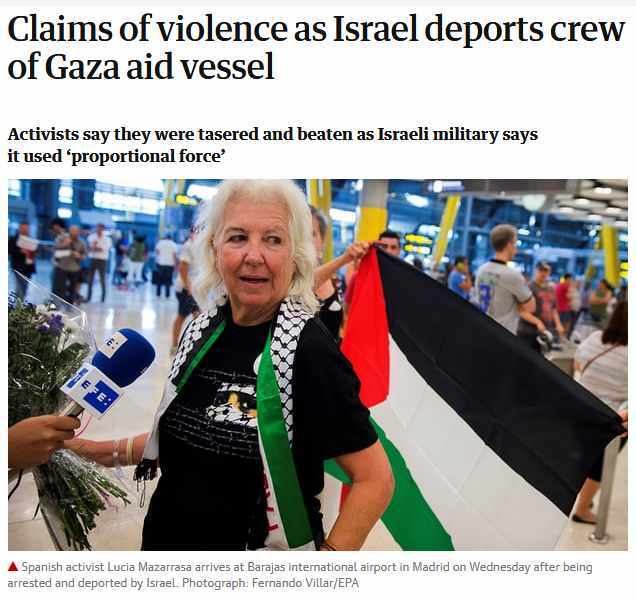 Whilst the Labour Party is engaged in a nauseous bout of ‘anti-Semitism’ navel gazing in the real world real people are suffering, but of course the ‘anti-Semitism’ nonsense in the Labour Party is intended to protect Israel from criticism. That is its only purpose. Below are some accounts of the outrageous attack on the first ship Al Awda. We await to see if Israel uses the same violence on the crew of the second ship, Freedom. Unsurprisingly Israel isn’t even bothering to go through any investigation into the allegations against it. I have also included the tape recording of the doctor with the group, Dr Swee Ang. See statement (below) re events a few days ago, when a ship Al Awda attempting to break the siege of Gaza, carrying medical supplies etc, was violently intercepted in international waters by Israeli warships. Hooded men took over the ship, beat up and tasered (to unconsciousness) the captain and second mate, assaulted other passengers, stole their phones and money (in most cases, not returned), and diverted the ship to an Israeli port and all on board to prison and later expulsion. 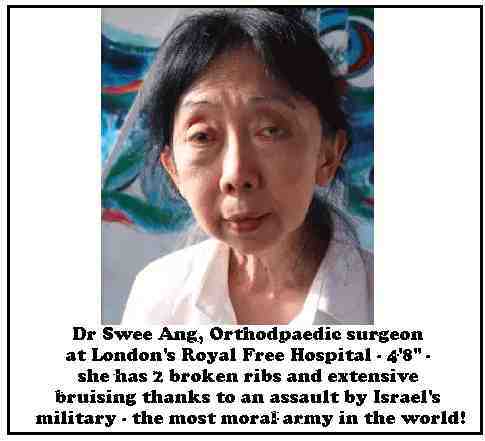 This account is by Dr Swee Ang, consultant orthopaedic surgeon at the Royal London Hospital. Swee is 5 foot tall at most and weighs less than 40 kg. She is left with substantial bruising and possible fractured ribs. And Israel can do all this with impunity! The last leg of the journey of al-Awda (the boat of return) was scheduled to reach Gaza on 29 July 2018. We were on target to reach Gaza that evening. There are 22 on board including crew with USD 15,000 of antibiotics and bandages for Gaza. At 12.31 pm we received a missed call from a number beginning with +81... Mikkel was steering the boat at that time. The phone rang again with the message that we were trespassing into Israeli waters. Mikkel replied that we were in International waters and had right of innocent passage according to maritime laws. The accusation of trespassing was repeated again and again with Mikkel repeating the message that we were sailing in international waters. This carried on for about half an hour, while Awda was 42 nautical miles from the coast of Gaza. As we entered the back of the deck we were all body searched and ordered to surrender our mobile phones or else they will take it by force. This part of search and confiscation was under the command of a woman soldier. Apart from mobile phones - medicines and wallets were also removed. No one as of today (4 August 2018) got our mobile phones back. I asked for the Israeli man with black mask his name and he called himself Field Marshall Ro.....Larry misheard him and jumped to conclusion that he called himself Field Marshall Rommel and shouted how can he an Israeli take a Nazi name. Field Marshall objected and introduced himself as Field Marshall ? Ronan. As I spelt out Ronan he quickly corrected me that his name is Ronen, and he Field Marshall Ronen was in charge. Suddenly Divina was taken out with me to the courtyard and Divina given 4 cigarettes at which point she broke down and cried. Divina had worked long hours at the wheel house steering the boat. She had seen what happened to Herman. The prison had refused to give her one of her medicines and given her only half the dose of the other. 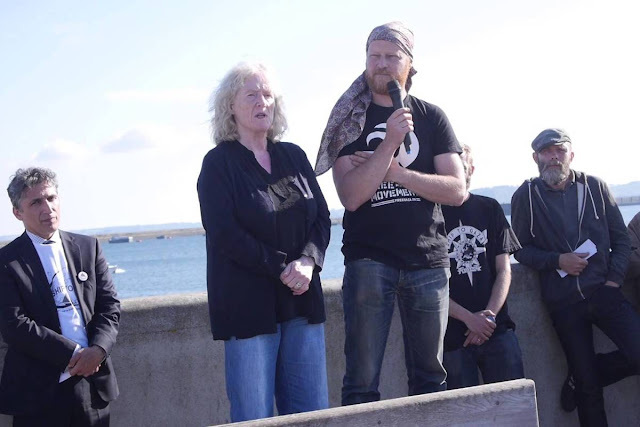 She was still on hunger strike to protest our kidnapping in international waters. It was heart-breaking to see Divina cry. One of the wardens who called himself Michael started talking to us about how he will have to protect his family against those who want to drive the Israelis out. And how the Palestinians did not want to live in peace...and it was not Israel’s fault. But things suddenly changed with the arrival of an Israeli Judge and we were all treated with some decency even though he only saw a few of us personally. His job was to tell us that a Tribunal will be convened the following day and each prisoner had been allocated a time to appear, and we must have our lawyer with us when we appear. Freedom is a gift for the Palestinian fishers of Gaza and is carrying a cargo of medical supplies , including #Gauze4Gaza. On board are 10 participants and two journalists from five countries. Details of all of the participants are here. The last news that we had from Freedom was that she was maintaining her course towards Gaza and the 'conscience of humanity'. Last Sunday, the Israeli Occupation Forces cut all communications and then violently attacked our lead boat ('Al Awda) in international waters, pulled down its Norwegian flag and trampled upon it. According to many testimonies that we have, including Yonatan Shapira, a former Israeli Air Force officer who was a participant aboard 'Al Awda', they then beat up and tasered several people and stole most of the participants' property. 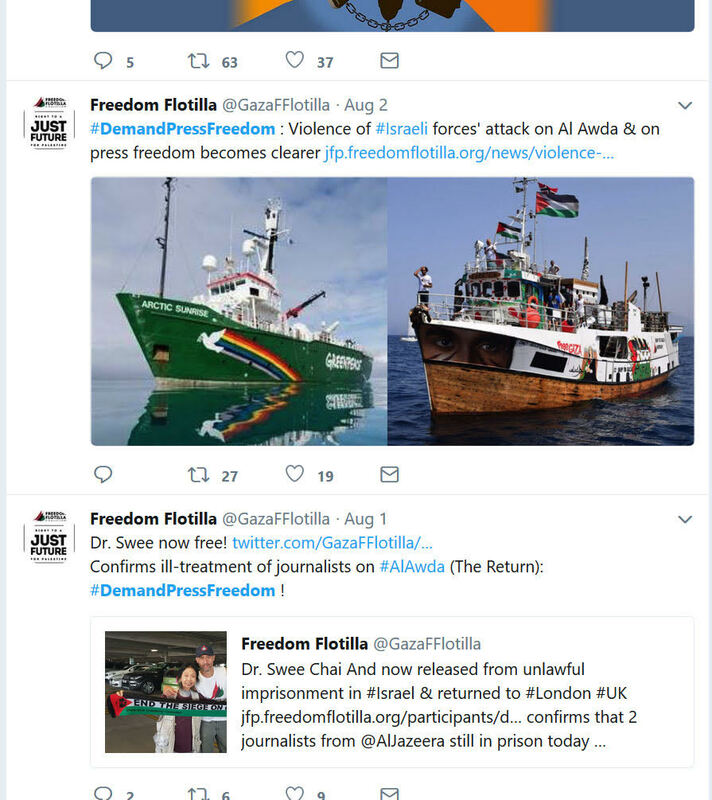 "The Freedom Flotilla Coalition calls on the Swedish Government, the national governments of those aboard Freedom, other national governments, and relevant international organizations to act immediately.” said Dror Feiler of Ship to Gaza Sweden, part of the Freedom Flotilla Coalition. 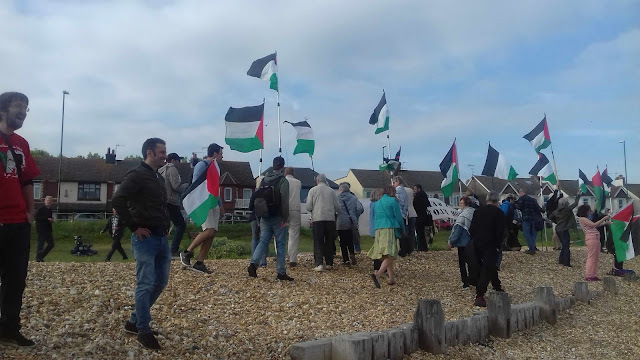 “We demand that the Israeli Occupation Forces not interfere with our unarmed yacht, as we continue our voyage to Gaza to deliver our gift of much-needed medical supplies”. 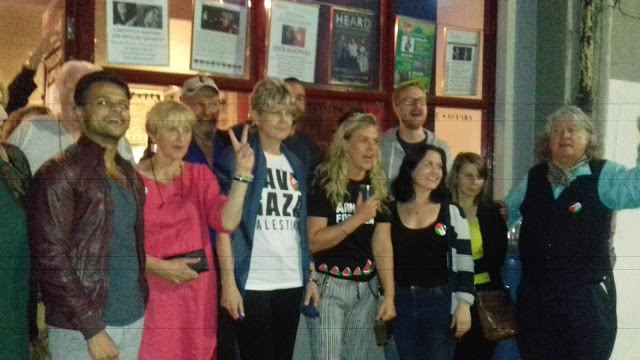 Swedish activists Charlie Andreasson and Divana Levrini, who were detained by the Israeli authorities on Monday while trying to break the blockade on Gaza, returned to their country on Friday. Speaking to Anadolu Agency, Levrini, who was detained after the ship in which she was travelling was intercepted by the Israeli navy, recalled her experiences in Israeli custody. This blog is having a temporary break!